If moving forward in music is scary—forging new paths, creating new sounds and genres—then looking back must be terrifying. That fear over the path you’ve chosen, even if it’s through previously charted lands, must be crippling. After all, we’ve moved on as listeners into a new age, and we tend to do so every few years. We’re fickle, determined to find the latest and greatest, and going back just isn’t an option. Then again, classics are such for a reason, and this seems to be how Gabriel Kelley views his music. The man is definitely moving forward and putting his own mark on music, but it’s with one eye firmly on the past—specifically the Golden Age of country music. I, for one, am thrilled to see it. Instead of wailing guitars and crashing percussion, such as those featured in “country” music of today, Kelley has crafted an album that rests firmly on the acoustic and steel guitars of yesteryear. It should be no surprise that Kelley has created a musically and lyrically solid album. After all, he’s been a part of the Nashville songwriting scene for years. It was that desperation to escape the latest country music craze, whatever pop/R&B mashup it may be, that led him to pursue this album. What listeners get is purity, with crisp lyrics, determined instrumentation, and zero frills. There’s still a rich, full-bodied sound, but nothing goes to waste. Every word means something, and every note has purpose. This is the way country music was meant to be, and it’s so refreshing to see Kelley bringing it back. Every song on the album, save for These Old Green Hills, is from Kelley’s own pen. In addition to his stellar songwriting chops, we get the benefit of some serious music legends on the instruments, including Reggie Young, who played with Elvis, y’all; Bekka Bramlett, who’s provided vocals for Fleetwood Mac and Joe Cocker; Brad Pemberton and Jon Graboff, who’ve played with The Cardinals; Dave Jacques, who’s played with Emmylou Harris; and the incomparable Gabe Dixon, who’s not only found success with his own group, but has also played with Paul McCartney and Supertramp. All of this amazing talent was wrangled and produced by Grammy-winning Neal Cappellino. With this kind of lineup, there’s no way to expect anything less than spectacular, and that’s what you’ll get with each track. The opening track, How Come, has an easy rhythm, a smooth swing syncopation that’s well connected by sweeping strings and punctuated with subtle percussion. There’s nothing jarring, and yet the song will climb right into your brain and hang out there for a while. This laid-back track then gives way to the opening harmonica of Faith, which has a bit more bite to it. The backing vocals blend perfectly while also infusing some soul and depth. The transition is then made to the title track, It Don’t Come Easy. If you don’t know what Gabriel Kelley is all about by the time you get to this song, you may not ever. This old-school two-step tune is gentle and sharp, smooth and gritty, simple and intricate. His ability to put together such a contradiction is only more evidence of his depth and maturity as a writer and musician. I don’t always choose ballads for my favorites, but I can’t stop playing When Is Enough. Tender and strong, this song of heartbreak hurts so good. Kelley’s voice was created to give voice to this kind of pain, and the supporting strings and keys just give more weight to the words, as good orchestration should. It’s a powerful and heady mix that makes me cry at the beauty and laugh at the brilliance, all at the same time. He doesn’t let us wallow too long before bringing out the driving Only Thing to Do. The transition is perfect for pulling us out of the melancholy and back into the beat. As a second-favorite song, this one does very nicely. 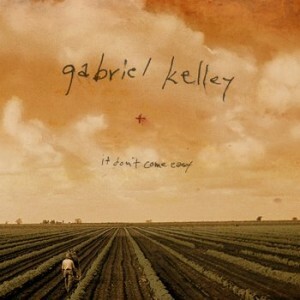 I had the great privilege of attending the CD release party, where I got to see Gabriel Kelley and the musicians from the album bring every song to life. Kelley is a magnetic performer, pitch perfect and full of life. Every song digs right down to the marrow when heard in a live setting, making the music from the album even deeper and more meaningful. I highly recommend the full experience—both the album and the live show—to truly understand what Gabriel Kelley is all about. You can pick up his CD today on his website or on his Facebook page. You can also keep up with his tour dates to see if he’s coming to a city near you. He also tweets on occasion, so you can keep up with him there, too. I’ve been saying for years that what’s called country music today is simply pop with a fiddle. Glad to see there are still a few folk upholding the old traditions of real country sound. I like this album. This record is extraordinarily done, from start to finish. It has been on constant rotation and with each listen I hear a new texture, layer, or subtle nuance I haven’t heard before. Gabriel’s voice is among the best out there and the vocals here are lush and rich with emotion throughout. In one listen of this record, your heart will be broken and healed (and possibly broken again—the last song on the record, “Holding Me Down,” may bring you to your knees!). The supporting musicians are incredibly talented and each shine in their contributions. A special mention for the superb backing vocals by Bekka Bramlett, which are the perfect match to Gabriel. The pairing of these two vocal talents was genius. In reading the story behind this gifted artist, “It Don’t Come Easy” surely seems a fitting title for the record. As a music fan, I appreciate every bit of painstaking detail, passion, and honesty that went into this work. Downloaded the record, and I’ve been blown away. Takes me back to the day of listening to great records. This is a must have record.